Tune up the mosh pit and turn on the sweat machine! 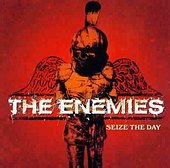 Seize the Day delivers 12 tracks of vocal chorusing from the Enemies and the grinning gutters of Oakland. This is old-school! Treacherous punk rock, burnt and golden like recycled Schaeffer spilling into the boulevard. Recently, at Satyricon, I missed an opportunity to catch The Enemies perform live. Arriving too late, I only manage to falter a greeting and pick up a cd, only to be blown back once again into the true blue old school salutes and punk rock grins. Intravenus infusions of uncompromised purity, sweat, blood, and beers. You either like it, or you love it! There are no in bewteens. And everyone else is back out on the pavement, beating the streets. Crank up the boom box and skate the cryptic half-pipe and the paved rock playgrounds painted-love like blood and concrete across America. This is music that demands cheap beer in a can. spit on the sidewalk, the continous underlying friction noises of skate trucks and broken wheels. If this isn't your bag, then move on to the pop rock section.